Composer, singer, actor, activist – Sting has won universal acclaim in all these roles, but he defies easy labeling. He’s best described as an adventurer, a risk-taker. As he himself said, “I love to put myself in new situations. I’m not afraid to be a beginner.” Husband and father of six, masterful guitarist and bassist, a devoted Yoga practitioner, and also a writer who has published his memoirs entitled “Broken Music,” he’s made a career, in fact, of new beginnings. 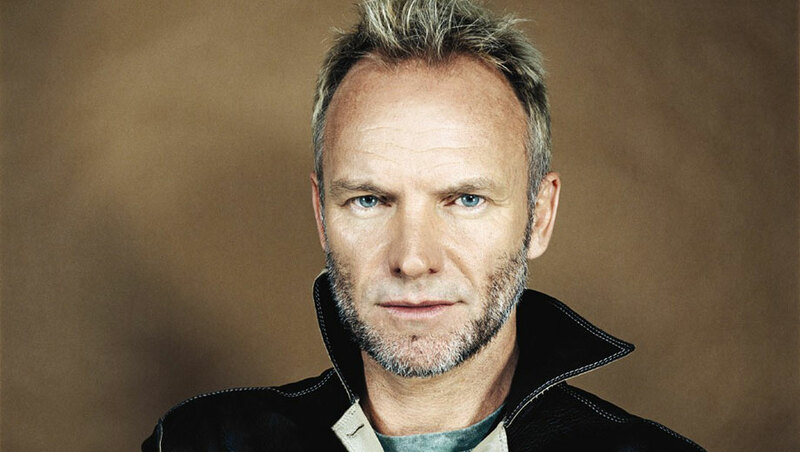 A milkman’s son from Newcastle, England, Sting was a teacher, soccer coach and ditchdigger before turning to music. Inspired equally by jazz and the Beatles (eclectic tastes that would prove prophetic), he met Stewart Copeland and they, along with guitarist Andy Summers, formed the Police in 1977. The band quickly became a success both in the UK and U.S. scoring several No. 1 hits including “Roxanne,” “Every Breath You Take,” “King of Pain,” and “Every Little Thing She Does Is Magic.” They earned five Grammy Awards and two Brits, and in 2003 they were inducted into The Rock and Roll Hall of Fame. The trio’s live work forecast the astonishing inventiveness and range of influences that Sting would realize fully in his solo career. With the release of Dream of the Blue Turtles in 1985, followed by Bring On The Night, Nothing Like The Sun, The Soul Cages, Ten Summoner’s Tales, Mercury Falling, Brand New Day and All This Time, Sting has evolved into one of the world’s most distinctive and highly respected performers, collecting as a solo performer an additional 11 Grammys, 2 Brits, a Golden Globe, an Emmy, three Oscar nominations, Billboard Magazine’s Century Award, and MusiCares 2004 Person of the Year. He has remained at the forefront of the public consciousness for 4 decades and has written some of the most enduring songs of our time, a talent perfectly showcased by his last record Sacred Love, released to both critical and commercial success. Most recently, Sting ventures into “new” musical territory with an album featuring the music of acclaimed Elizabethan songwriter, John Dowland (1563-1626) entitled Songs From the Labyrinth. He has also appeared in more than 10 films and in 1989 starred in a Broadway play the “Threepenny Opera”. Sting’s support for human rights organization like the Rainforest Foundation, Amnesty International, and Live Aid mirrors his art in its universal outreach. Along with wife Trudie Styler, Sting founded the Rainforest Foundation in 1989 to protect both the world’s rain forests and the indigenous peoples who live there. Together, they have raised more than 19 million dollars with their 14 benefit concerts to raise funds and awareness of our planet’s endangered resources. Since its inception, the Rainforest Foundation has expanded to a network of interconnected organizations working in 18 countries around the globe.